TCM the dealer-led forklift brand has announced two new dealerships to further strengthen its national sales, service and support network. Ace Handling, a Midlands-based forklift supplier with a 16year back story in the industry has been awarded the Rugby, Northampton and Coventry sub-region as the official TCM outlet and Lothian Mechanical Handling based in Bathgate near Edinburgh will become the exclusive TCM dealer for the central Scotland industrial belt. 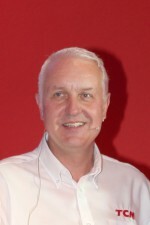 Graham Jones dealership director (pictured) said, “Our brand is based on a strong locally based dealership core which provides local service and support on a unique basis which is tailored to suit our customers. It means that customers always have a local contact point for all their needs and avoids them getting tangled in national call-centres or remote support services”.